We're pre-empting this regularly scheduled Feedback Friday to solicit more suggestions about the Pioneer Wine Trail and Lake Michigan Shore Wine Country for our Get Me to the Grapes! 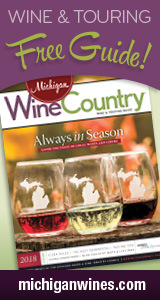 Guides, online travel guides outlining "must see" and "must do" features around Michigan's wine trails. And all of the content will be fueled by YOU! In our initial push in October, we received TONS of recommendations for the northern wine trails (Leelanau, Old Mission). Now, we're hoping to get some great suggestions specifically from Lake Michigan Shore Wine Country, the SE Michigan Pioneer Wine Trail, and the smaller offshoot trails. Read on for how you can get involved and help other wine lovers make the most of their trail travels! Just to clarify, we're not looking for winery recommendations here; we're focusing on all of the ancillary places along the wine trails. The wine trail/area to which your recommendation pertains (i.e., "Old Mission Peninsula," "Pioneer Wine Trail," etc.). The name of the place/attraction you're recommending (preferably with a link to their website, but at the very least, a general crossroads and city). A description of at least one complete sentence (but the more detailed the better) of why you recommend this. Feel free to email us at cort@michiganbythebottle.com with any questions. We're looking forward to the great discoveries ahead!